The British Council of Shopping Centres (BCSC) Conference and Exhibition attracts a wealth of professionals from the retail property sector, such as owners and developers Westfield and Land Securities, to architects, designers and retailers. "It's an annual event so we try to keep it as fresh as we can," says BCSC client services manager Erin Rigg. "We have moved year on year, but the size of the event means it can be challenging to find suitable locations. We need an exhibition space of 6,000m2 and an auditorium that can take 1,500." The event returned to Manchester Central, having also been there in 2010. "It's a good central location and as a venue it gives us everything we need," says Rigg. "It is nicely self-contained and the team there is fantastic to work with." "This event differs from a number of other association events because the exhibition is such a major anchor," explains Rigg. "We have found the numbers attending plenary sessions dwindling and a lot of people won't leave the exhibition hall, because for them it is a deal-making event. So the challenge for us is to balance that side of the event with the educational element." "This year we tested running concurrent seminar sessions," she says. "On the Tuesday and Wednesday of the event we had three separate sets of short, 45-minute seminars running and they were incredibly popular." The event has traditionally taken place in November but it was the first time the BCSC had held it in September. "There were two reasons for that," says Rigg. "Firstly, at this time of year there are a lot of industry events going on but secondly, because of the deal-making nature of the exhibition, by having the event earlier in the year it means exhibitors can follow up business before Christmas." Optional study tours and a golf tournament were held on the Monday morning, the exhibition opened at 2pm and the event kicked off with a welcome party at 6pm. Plenary sessions began at 9am on the Tuesday, followed by the seminar programme and a final two hours of plenary in the afternoon. The conference closed at 5pm and a Happy Hour was staged in the exhibition hall. Further seminars were held on the final day. "Delegate numbers were up on last year - 2,575 compared with 2,428. Exhibitor numbers were up - we had 85 exhibiting organisations this year. We were also trying hard to attract newcomers, with a number of initiatives such as reduced delegate rates for the under-35s. We were delighted that the number of first-time visitors was 250," says Rigg. 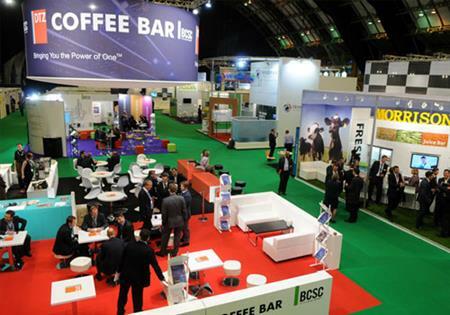 The BCSC has decided to amalgamate its annual Shopping Centre Managers' Conference with the annual conference and exhibition, which will be held at the ACC Liverpool in September. "We are faced with the challenge of guaranteeing a successful event for increased numbers of delegates and exhibitors," says Rigg.